My girls were due to arrive this Monday, but because of the crazy weather down south (they're coming for Georgia) delivery is being rescheduled. No deets yet, but the extra time will give me an opportunity to practice getting the smoker to work properly. MMMM.....smoked ribs with bee sauce. Get your **** together, Vin. And realize where you fit in the colony. Otherwise you'll just thunp them into Polanderdom. I found my books and lecture material if you want to take a look. Oddly, the guy across the street has about 10 hives. But they're only one frame high. I worry for the girls. I'm going to go talk to him soon. Little bit nervous at the moment - I really don't want to screw this up. Grace is a tad more nervous as she's the one that has to go pick up the package of bees from the apiary. Made some simple syrup just in case their feed can is empty from the trip. Grace can give them a few squirts while she waits for me to get home. I've got a single 10-frame deep box ready for the initial install. Will add a second deep box once they've drawn out 7-8 frames of comb. I for one would bee remiss if I did not wish our new resident Apiarist the best of luck! Holy crap that's a lot of bees! So the queen is separate in there or in another box or something, this is truly fascinating, though only enough to live vicariously through you. You better bee-live it! Not in my wildest dreams did I think this was going to go as easily as it did! The bees wanted NOTHING to do with me or Grace. 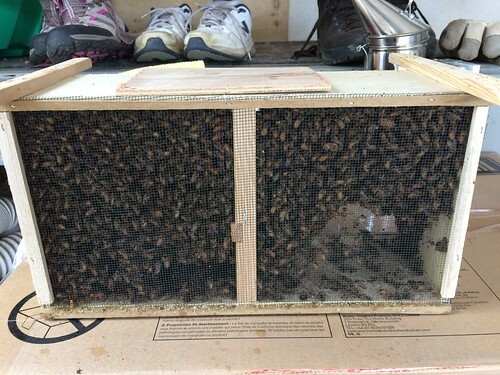 They wanted to get into the hive and start making it their home. The sugar syrup and pollen patty didn't hurt, I'm sure, but while there were a lot of them flying around initially, within minutes they were making a, uh, beeline(!) for the hive. 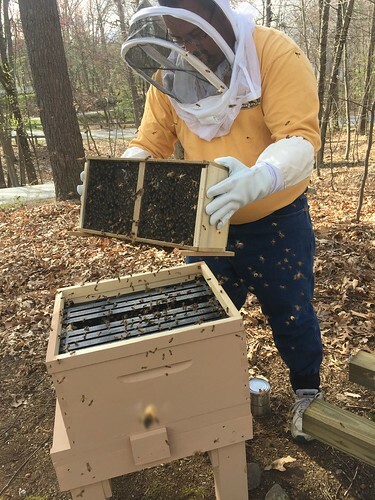 Here's me initially shaking the package of bees into the hive. Literally just dump them in. Some fly around, but most start exploring their new digs. Here are the bees crawling around the frames. At the far left is a feeder frame that's filled with the sugar syrup. 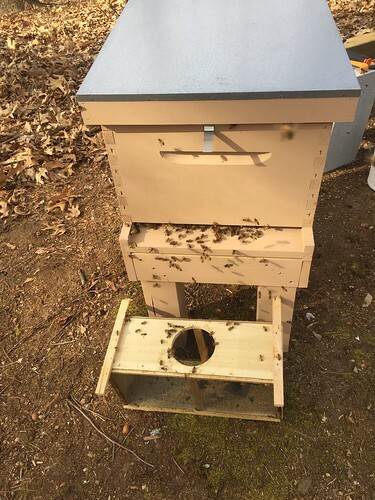 There are little bee ladders that extend down into the feeder so the bees can climb down, gorge on syrup then climb back up. Bees are notoriously bad swimmers and even worse snorklers, so having something for them to hold on to is really important. The syrup provides them with the necessary carbs they need while waiting for the New Engalnd flora to start blooming. That chunk of cake looking thing is a pollen patty. The bees feed on that as well - protein source. Between the syrup and the pollen patty, they've got what they need to fill their little bee bellies and start making honey comb. 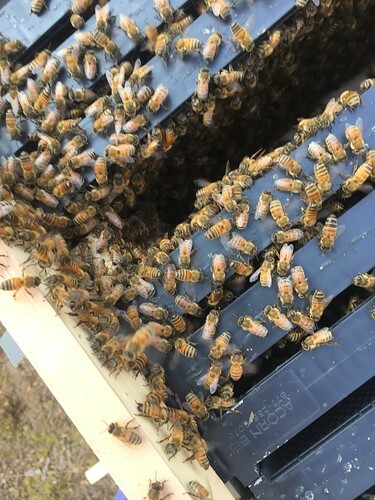 The bees clustered around that gap between frames are getting acquainted with their queen. She's in a little queen cage that hangs between the frames. She'll eat her way out of her enclosure over the next few days, and if all goes well, begin ruling over her hive. 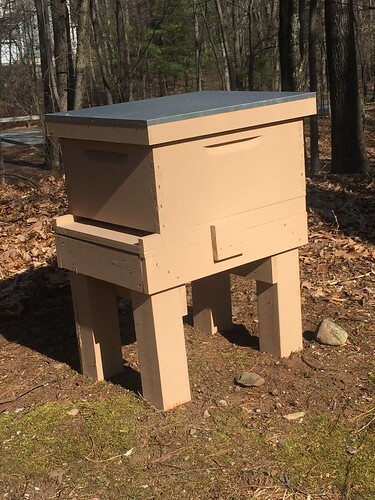 The package is almost empty -- will leave it in front of the hive for a bit, and eventually the remaining bees will find their way out and into the hive. 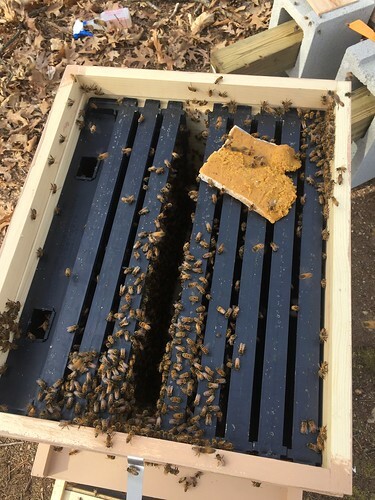 The bees mostly enter and exit the hive via the bottom board. It's here where the guard bees will stand watch (seriously), and it's here where the bees will take out the hive's trash -- such as dead bees. 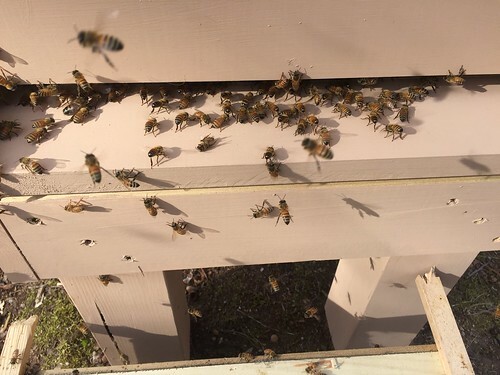 Was your queen a part of this hive before they shipped, or is she new to these bees? That's so cool! You can start making your own honey mead next. The queen was shipped with the bees, but she's not "their" queen. Thus the need for the acclimation period. I'm a little jittery, please excuse my outburst.